Sometimes given the Latin name Arctium lappa ssp. minus. 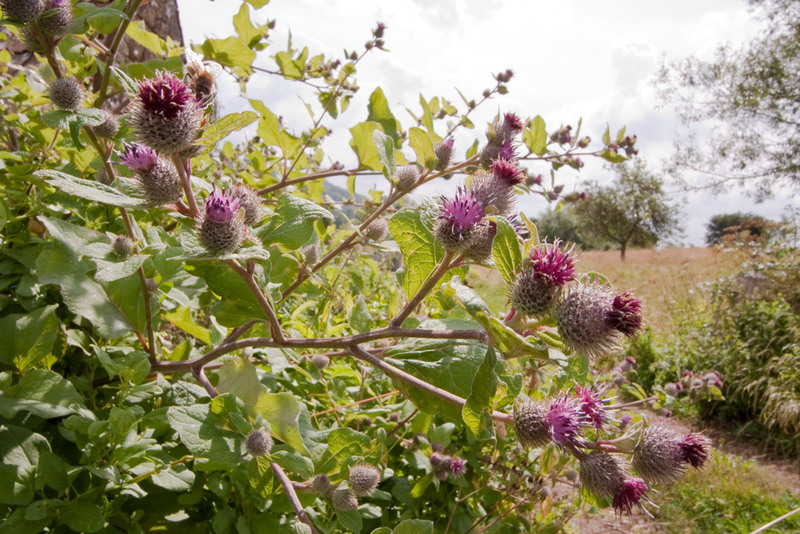 Lesser burdock is a tall, broad-leaved plant with hollow stems and clusters of short-stemmed, purple, brush-like flower heads which appear from July to September. The bracts of the flower heads end in hooked bristles (a bur) which catch on fur and clothing, allowing the seed to be spread over a large area. The burred fruit and leaves have a superficial resemblance to those of dock hence the common name of Burdock. Lesser burdock is most characteristically found as a colonizer of fertile, disturbed sites near the edge of woodlands or within woodland clearings but is intolerant of deep shade and can also be found in hedgerows, roadsides and waste ground. Lesser burdock takes two to four years to reach maturity. The shade cast by its large rhubarb like leaves suppresses the growth of neighbouring plants. Once the plant has set seed it dies but the space created by the leaves allows the next generation of seedlings to colonize. Sow at any time of the year. Germination can take a long time so a light scarification might be useful. Lesser burdock can be used with EH1, EW1 or EM10.